Photo by Nelson A. KIng Essence Kelly and Tiara N in Suga Candy costume. On an unusually very hot Labor Day, over three million spectator and tens of thousands of masqueraders and revelers converged on and jammed down Brooklyn’s sprawling Eastern Parkway for the largest carnival parade in North America under the ubiquitous eyes of officers from the New York Police Department (NYPD). 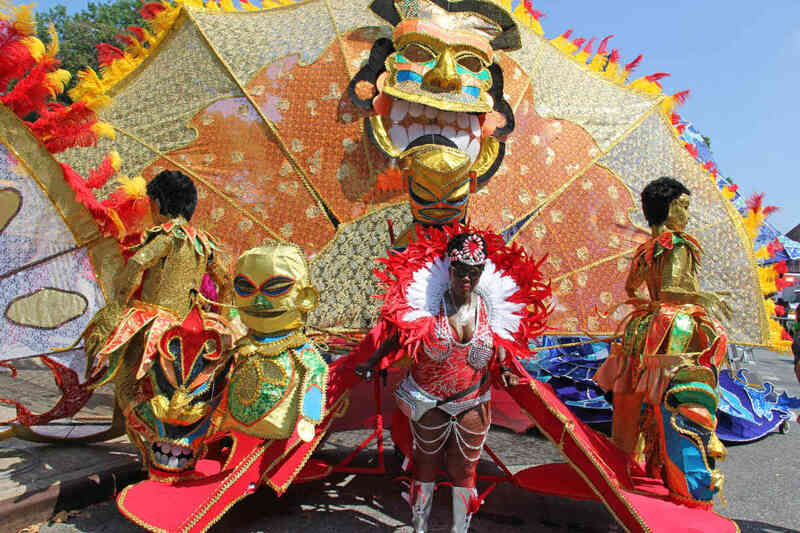 In the stifling, sweltering, humid weather, police on Monday kept a very watchful eye on masqueraders, revelers and parade-goers in their attempt to avert any killing or violence that had marred the spectacular parade in previous years. The artistry, creativity, dexterity and musical talent of the Caribbean were fully on display along the 3 ½-mile-long parade route that began at Buffalo Avenue and ended on Flatbush Avenue, near Grand Army Plaza. Along the way, a cornucopia of colors and a potpourri of Caribbean delicacies wafted the air and gaiety, as masqueraders and revelers gyrated to the hypnotic soca, reggae and zouk music blaring from gigantic speakers and disc jockeys mounted atop huge flatbed trucks. The spectacle, organized by the Brooklyn-based West Indian American Day Carnival Association (WIADCA), capped five days of carnival extravaganza that began on Thursday, with “Reggae, Afrobeats and Soca Unda Di Stars” at the Brooklyn Museum. Two weeks before, with the spectacular display of some of the costume productions for this year’s Labor Day Parade, WIADCA launched the 51st Annual New York Caribbean Carnival Week at the Brooklyn Children’s Museum. “It’s a lot of fun in the hot sun,” said Jamaican Alexis Reid, portraying “Sparkle” during Monday’s carnival parade, for the mas band 1199 SEIU, accompanied by Trinidadian Jada Sandy. “It’s the first time playing mas,” exulted Reid, a Brooklyn resident. Nearby, Haitian Essence Kelly, played with Suga Candy Mas. Guyanese Gail Larose and Odessa Medouze brought along their daughters, Savannah Chandler and Martisha Medouze, respectively, to play with Ramajay. As she carried a Stronjah-designed, huge costume down the parkway, Barbadian Silleta Davis, said she was having a good time. “I feeling good,” he shouted, swaying to the soca beat. An injured right leg did not prevent Barbadian Seyanna Jordan from travelling from Winnipeg, Manitoba, Canada, to participate in the Labor Day Carnival for the first time. “It’s good,” she said, accompanied by her boyfriend, Jeremy Zloty. Seventeen-year-olds Vincentian Shania Leon and Kaya Richards, and Puerto Rican Paul Melendez jumped with Boom Mas. “I feel it’s a good thing to bring the culture together,” said Richards, reveling for the first time in five years. Fresh from participating in J’Ouvert, Grenadian Richard Hypolite, presented the “Jab, Jab” segment. “This is my life,” he explained, playing with Kaios International for the second successive year. He previously played for Antoine International. “I’m 50, am still enjoying my life, and enjoying my culture and my mas,” he added. Another Trinidadian, Allison Mierez, trekked from Connecticut to play, for the seventh consecutive year, with perennial Band of the Year Champions Sesame Flyers. The carnival parade was preceded by the annual breakfast, at the Lincoln Terrace Park, at the beginning of the parade route. There, a virtual Who’s Who in New York politics addressed the crowd. Many of the legislators, including New York Gov. Andrew Cuomo, sought votes in next week Thursday’s Democratic Primary. New York City Mayor Bill DeBlasio and his wife, Chirlane McCray, one of the parade’s grand marshals, who traces her roots to St. Lucia and Barbados, were also on hand, as well as a plethora of Caribbean-born and Caribbean American elected officials. The Caribbean legislators included US Congresswoman Yvette D. Clarke, New York State Assembly Members Jamaican-born Nick Perry and Michael Blake; Perry and Blake’s Assembly colleague Rodneyse Bichotte, and New York City Council Member Jumaane Williams, who is a candidate for New York State lieutenant governor. 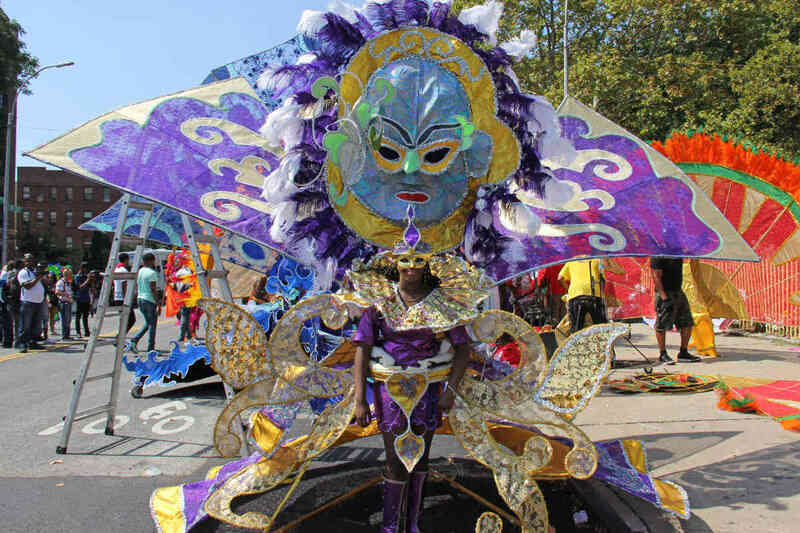 The five-day carnival also featured the annual “Summer Jam: Stay in School Concert and Youth Fest” and “Brass Fest” on Friday; Junior Carnival and Panorama on Saturday; and Dimanche Gras, on Sunday, highlighting King, Queen and Individuals of the Bands, as well as “Calypso and Cultural Ambassadors” Lord Nelson, King David Rudder, Denise Belfon, Explainer and Ras Iley.